The University of Missouri's Branson Geology Field Camp has integrated a series of environmental geology components into its curriculum, including hydrogeology and geophysics. In this paper, we present the results of a dye tracing experiment carried out by undergraduate students as the capstone field experiment of an optional advanced hydrogeology week at the camp. The dye tracing experiment was along the Popo Agie River, which disappears into a karst cave system in Sinks Canyon State Park, Wyoming, and resurfaces about 400 m down the canyon in a large, spring-fed pool, called the "Rise." At the time of the test, the discharge rate in the river was 4,585 l/s (162 ft3/s). The students used skills developed during the required first week of hydrogeology, including dilution gauging and automated data acquisition, to design and carry out a dye tracing experiment to evaluate flow through the cave system. The leading edge of the Rhodamine WT dye pulse took just over 2 hours and 5 minutes to travel the short distance between the Sinks and the Rise. The peak dye concentration at the Rise was reached 2 hours and 47.5 minutes after the dye addition. The water residence time in the Sinks Canyon cave system was similar to results reported by the U.S. Geological Survey in 1983, indicating that the cave's physical flow system has not changed in the last 23 years. Students participating in the advanced hydrogeology week rated the interest and value levels of the dye tracing test high and several of the students presented their results at the Geological Society of America 2006 annual meeting. The study of natural hazards is an effective way to capture the interest of students in the earth sciences. Recent natural disasters such as Hurricane Katrina and the December 2004 earthquake and tsunami in the Indian Ocean highlight the powerful magnitude of such events and our vulnerability to them. There are several effective ways to use online resources to study natural hazards. At CSULA, we have incorporated several online activities to enhance the learning experience in earth science classes. We have also piloted an online Natural Hazards course in addition to our traditionally-taught lecture course. We discuss the merits of the online course and the online activities used in our undergraduate earth science courses as well as review several other online resources useful for earth science education. Student surveys suggest that online activities increase student interest in the earth sciences. We share our experiences using online resources for the benefit of other instructors who are interested in adding multi-media to their earth science courses. An analysis of teacher education programs at the University of Akron prompted the development of courses to address nature of science in an inquiry context. A new course, "Geology Service Learning" was developed with the primary educational objective of providing both undergraduate geology majors and future teachers with research experiences where they collect, analyze, and interpret real world data. Students work in teams to complete a semester long, service learning, research project that focuses on resource management issues of the local Metro Parks. Collaboration between a science education and a geology instructor produced an evaluation plan to assess variables of interest (students' acquisition of environmental geology concepts and skills, and their conception of the nature of science). Data sources included students' responses to a standardized nature of science instrument, students' preliminary analyses of an environmental problem, students' responses to email prompts, and their preliminary drafts and final report. Findings suggest that nature of science concepts must be taught contextually, that is, must be experienced within an inquiry-based context. The final reports submitted to the Metro Parks are evidence that by the end of the course students were capable of doing science and producing meaningful results. Student data and recommendations were used by resource management staff of the Metro Parks to make significant decisions. Earth Systems, a new course developed expressly for pre-service middle school teachers, was developed in response to new Ohio Academic Content Standards in Science and the rigorous Ohio Graduation Test. The course is designed to increase students' content knowledge, research skills and confidence in teaching Earth systems science. It is broken into three modules in which students examine volcanic eruptions, global warming, and the latest ice age. Working in teams, the students determine how each of the above phenomena affects and is affected by Earth's systems. The students then jigsaw into new teams to work out how the various effects in the system create positive and negative feedbacks that determine the ultimate impact of the event (eruption, etc,) on the Earth system. Each group produces a report that is assessed using a rubric. Students are individually assessed through lesson plans and journals. Geologic time is a central concept in Earth science teaching and research, but undergraduate students are seldom involved in doing time: measuring 'ages' of rocks or minerals. Integration of apatite fission track (AFT) analysis in geoscience classes is an accessible way to involve students in determining dates for geologic events. 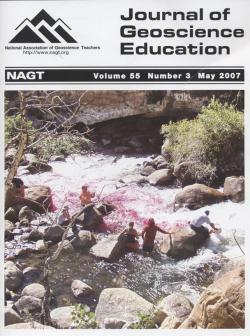 AFT analysis is an active-learning, inquiry-based technique in which students can visualize and understand concepts such as radioactive decay and its relationship to geologic ages, and the method and its applications can be a basis for cross-discipline instruction within a physical sciences curriculum. Fission-track analysis exercises can be incorporated into a variety of physical science classes or can be run as a separate workshop on geologic time or tectonics. We present a teaching module for incorporation of AFT analysis into general physical geology or historical geology lecture and/or laboratory. This exercise involves counting fission tracks using images from prepared samples (apatite grains already separated from a rock) with known uranium content. The data collected by students can then be used to demonstrate a variety of concepts, from radioactive decay to time-temperature paths and rates of geologic processes. With this module, undergraduates learn problem-solving techniques and experience a hands-on, quantitative approach to geologic time, rates of geologic processes, and the scientific method in general. Science instruction in elementary school classrooms is frequently lacking in the United States. One factor that impacts the amount and quality of science instruction is teacher attitudes toward science. The Earth Science Mini-Lesson Project is a strategic program created to help improve preservice elementary school teachers' attitudes toward science in a one-semester college class. Students participating in this project create earth science mini-lessons on topics taken from the Utah Core Curriculum Standards and teach them to elementary students at a local Title I grade school. Attitude survey results from both semesters showed that this service-learning outreach program positively affected students' attitudes after minor adjustments to the project organization. This is a simple, inexpensive, yet effective, project that can be implemented in a one-semester college science course for preservice elementary teachers that can help improve their attitudes toward science. This paper illustrates the capabilities of geographic information systems (GIS) software to create and display silicate structures. These models require no knowledge of editing functionality within the GIS software. Instead, the required input is the coordinates of the individual atoms or tetrahedra constructed in a word processing or spreadsheet program. These coordinates are then imported into the GIS software, and can be used to display chain, ring, sheet, and framework structures. Links to silicate models exported from the GIS software in a virtual reality modeling language (VRML) format are provided. These models can be displayed using a web browser equipped with any freely available VRML plug-in. Creating GIS-based silicate structures is an alternative to other software packages such as CrystalMaker® and Xtaldraw® designed specifically to create and display atomic structures. Although these GIS-based methods do not have all of the functionality of custom applications, GIS is a pervasive and growing technology with numerous applications in earth sciences and many other disciplines. Instructors may consider using this GIS-based method to introduce geospatial concepts, illustrate the breadth of GIS applications, and to establish interactive links between mineralogy and other disciplines. Theoretically and anecdotally, bridging programs that facilitate the transition from high school to college should increase the recruitment and retention of students into universities. Ideally, this type of program is deemed 'effective' if the program results in an increased number of the target population actually receiving a college degree. Thus, unless short-term indicators of success can be identified and measured, the program cannot be evaluated until five or more years have passed. The Rural Alaska Honors Institute (RAHI) at the University of Alaska Fairbanks is a bridging program aimed at preparing rural Alaska high school juniors and seniors for college. A geoscience course was recently added to the program in an effort to recruit Alaska Native students into geoscience careers. Using the concept of a geoscience career 'pipeline,' we developed a survey to evaluate the effectiveness of the program in recruiting potential geoscience majors. By using rigorous survey construction and testing methodology, we developed a survey that we are confident provides a short-term measure of the course's effectiveness in promoting the acquisition of the attitudes and knowledge associated with retention in a geoscience career pipeline. Keys to developing an effective survey were: identification of the model being tested; cognitive testing of survey questions; and identification of a control group. Results of the survey suggest that the RAHI geoscience course is an effective means of recruiting potential geoscientists.